tarazi, Z., hakimi, A., Jafary Nodoushan, A., aghaei, H., saberi, F. (2019). The Effect of Cognitive-Behavioral Training Based on Self-Esteem on Social Adjustment and Academic Achievement Motivation of First-High School Girls students in Ashkezar. Iranian journal of Learning and Memory, 1(4), 1-1.
zahra tarazi; azam hakimi; ali Jafary Nodoushan; hossein aghaei; fariba saberi. "The Effect of Cognitive-Behavioral Training Based on Self-Esteem on Social Adjustment and Academic Achievement Motivation of First-High School Girls students in Ashkezar". 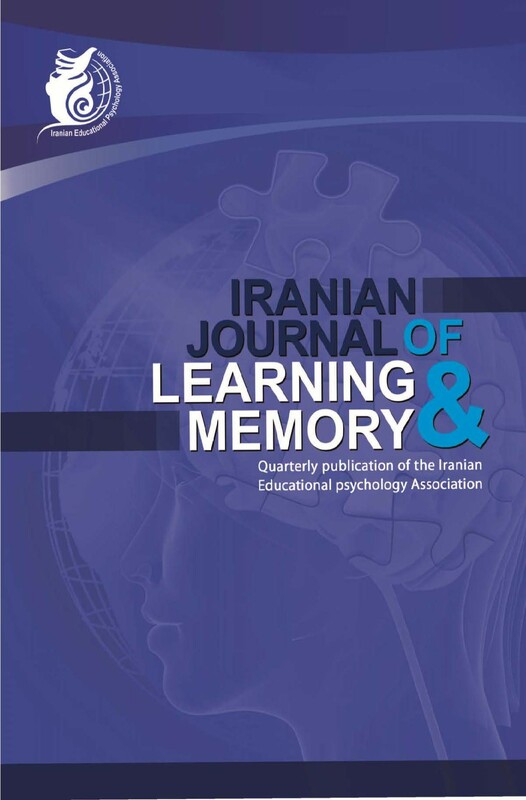 Iranian journal of Learning and Memory, 1, 4, 2019, 1-1.
tarazi, Z., hakimi, A., Jafary Nodoushan, A., aghaei, H., saberi, F. (2019). 'The Effect of Cognitive-Behavioral Training Based on Self-Esteem on Social Adjustment and Academic Achievement Motivation of First-High School Girls students in Ashkezar', Iranian journal of Learning and Memory, 1(4), pp. 1-1.
tarazi, Z., hakimi, A., Jafary Nodoushan, A., aghaei, H., saberi, F. The Effect of Cognitive-Behavioral Training Based on Self-Esteem on Social Adjustment and Academic Achievement Motivation of First-High School Girls students in Ashkezar. Iranian journal of Learning and Memory, 2019; 1(4): 1-1. 2Guidance and Counseling,Islamic Azad university, Ashkezar Branch, Yazd, Iran. The aim of the present study was to evaluate The Effect of Cognitive-Behavioral Training Based on Self-Esteem on Social Adjustment and Educational Achievement Motivation of First-High School Girls students in Ashkezar. The design of this study was an experimental pretest-posttest with control group. The participants were included all high school girl students in the city of Ashkezar and the sample were included 30 high school girl students that select via cluster randomly sampling method and were divided randomly into two groups (experimental and control). The Instruments that using in this study were, Bel (1961) social adjustment scale and Academic Motivation Scale (AMS). Cognitive-Behavioral Training Based on Self-Esteem included 8 sessions that trained for experimental group. Mancova was used to analyzing the data. The result of this study showed that Cognitive-Behavioral Training Based on Self-Esteem increase social adjustment and achievement motivation of high school students in experimental group in compare with control Group (p<0/05). So, the result of this study showed that Cognitive-Behavioral Training Based on Self-Esteem are important intervention to increased social development and psychological health of students.